thinking that it's hopeless, that cats are basically untrainable? or exhibits unacceptable aggressive behavior. The key to Pam's success rate is her real intimacy with cats - she understands the way they think, she knows what they like and what they don't like. She understands why they are behaving so strangely. Once she gets to know the cat, she can adjust behavior, distract the cat with play therapy, and then retrain it. In this guide, you can learn her methods and retrain your cat. Divorce won't be necessary; you will live together amicably from this time forward. 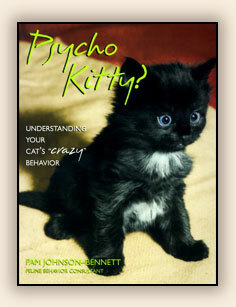 "With friends like Pam Johnson-Bennett, cats will no longer require nine lives. Cats are the most popular pet in America, also the most misunderstood. Johnson-Bennett serves as a sort of feline translator, understanding and ultimately solving mysteries such as why cats miss their boxes, or use the sofa as a scratching post. In doing so, she saves precious lives. Of course, the kitties Johnson-Bennett saves aren't really psycho, they're simply in need of someone who can comprehend what these cats are trying to tell their people." As a Feline Behaviorist, Pam Johnson-Bennett has appeared on numerous television and radio shows, written articles for the top cat publications, and has been profiled nationally in magazines and newspapers. She works on a referral basis by veterinarians. Her housecalls cover everything from routine training problems to the most eccentric feline behavior. In Nashville, she can be heard on WKDA-AM, hosting her weekly radio show, "The Pet Hour." Her first book, Cat Love, was inducted into the Cat Fancy Hall of Fame. Her second book, Twisted Whiskers, was honored with the Cat Fancy Editor's Choice Award and received the Cat Writers' Association Certificate of Excellence. She has also authored Hiss and Tell: True Stories from the files of a Cat Shrink and Cat vs. Cat. Pam lives in Nashville with her husband, four cats, and a dog.